The Glock 17 is one of the most popular pistols of all time, and is capable of serving many needs - a Glock 17 holster should be capable of doing the same. The Alien Gear ShapeShift Glock 17 holster is designed to do just that. The 17 is one of the few full-size guns that is easily concealed, and the ShapeShift can be easily configured as a Glock 17 concealed carry holster - both in and outside the waistband, on the hip or in the appendix position. The 17 is also widely employed as a service pistol, and the ShapeShift can likewise be worn as an easy concealing OWB holster and paddle holster. This Glock 17 holster is compatible with all Glock generations, from the original Glock 17 all the way through to Gen 5. Alien Gear spent two years designing this holster to be able to carry in multiple styles without compromising one iota in the way of retention, fit or concealability. First and foremost is the shell system. You get two half-shells, one right and one left, that cover the slide and the trigger guard. There are also two trigger guards, one for standard half-shell carry and another set up for belt slide carry. 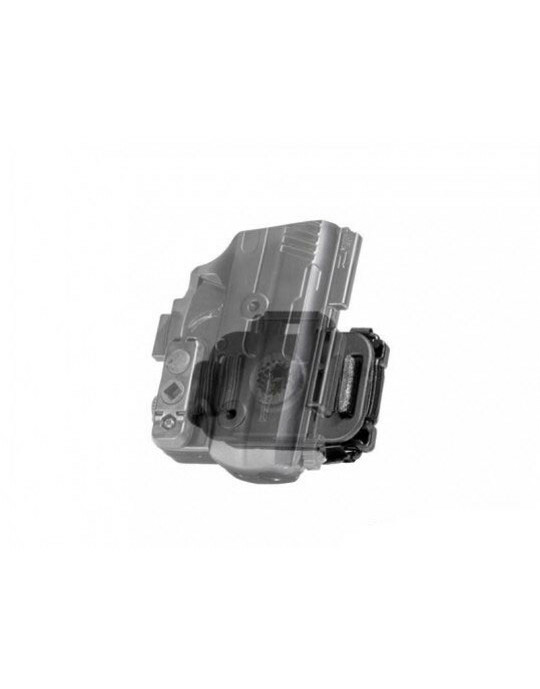 The half-shells and trigger guards fit together by means of a patented friction-locking rail system. Once put together, they don't come apart unless you mean them to, especially once you engage the twist lock. From there, you determine the manner in which you carry. 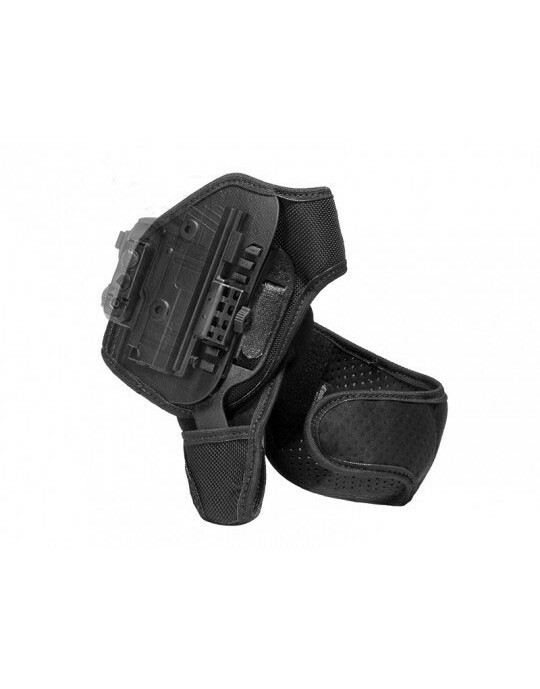 We include several different belt attachments and two backing pads with your Glock 17 carry holster system. For a traditional Glock 17 IWB holster, attach a full shell and trigger guard shell to the larger backer, which is made from the same materials - neoprene backer, steel core and Alien Skin top surface - as our Cloak Tuck 3.0. Just like the 3.0, it can be adjusted for grip cant and ride height, and is compatible with our IWB Cloak Dock holster mount. If you prefer a Glock 17 appendix holster, attach the the shells to the smaller backer and install the larger belt clip. There are also two possible Glock 17 OWB holster configurations. One - which uses the smaller backer and the belt slide clips - is fantastic for OWB concealed carry as a high-riding belt slide, and the other is our strongest holster design to date. Attach the two half-shells together, and then install the included paddle attachment. This gives you a Glock 17 paddle holster. Retention is adjustable with the ShapeShift. There are three included passive retention bars, which instal in the trigger guard half shells for light, medium or heavy passive retention. You can also install and use the thumb release, the finger lock or both with the paddle holster configuration, for a Glock 17 retention holster that approaches Level III retention. We set out to change what you can expect from a holster, but not our guarantee - as Alien Gear's is one of the most comprehensive in the industry. First, you get the first 30 days after purchase to wear your holster and determine if it really is the holster you desired. If not, contact us and we will arrange a refund. We will buy the holster back during the first 30 days if you don't like it. We also give you a lifetime warranty on the holster. Whatever goes wrong, we will fix it or replace the holster outright regardless if it's due to a manufacturing defect or damage sustained during the course of normal or abnormal wear. As long as you own it. This may be the last holster you ever have to buy.